With every new format comes the chance to release box-sets of classic movies once again; those movies that, regardless of whether we’ve seen them a thousand times or whether we already own them on numerous formats, they become must have purchases. Indiana Jones, Star Wars, Back to the Future – these are all box-sets that film fans will have to buy on each and every format on which they become available, and the Superman movies are no exception – only this time the movies also include Superman Returns, the 2006 movie starring Brandon Routh as the red caped one, rather than Christopher Reeve. The original two Superman movies, unknown to many, were actually filmed back to back, so assured were Warner Brothers that the first movie would be successful. They were on pretty safe ground mind you, considering they had a cast that included Marlon Brando, Terrence Stamp and Gene Hackman – these guys wouldn’t put their names to just anything. The first Superman exists on this Blu-Ray set in different formats, with the option of watching a full, extended version or even a version devoid of dialogue and sound effects, so you can really appreciate the music of John Williams – possibly the greatest film music composer of all time. The extended version of the film does make the movie drag on considerably (especially considering the original Superman was a lengthy film anyway) and contains additional scenes from the Superman and Lois flight sequence, more scenes from Krypton before the planet exploded and even a scene where Superman seeks his father’s advice on showing off. As good as the first Superman movie is, and it is good, it’s the second film where the franchise really gets going. There are few movies where the sequel is arguably better than the original, Godfather II, Empire Strikes Back for example, but Superman II is without question one of them. Superman II is all love story, much like George Lucas’ second Star Wars instalment, set against the backdrop of an impending crisis. The three super-villains, imprisoned in the Phantom Zone, have escaped and are heading to Earth to rule. Terrence Stamp, as General Zod, is in imperial form and seems to be loving every second of it. Gene Hackman returns in even more evil and despicable mode than he was in the first film, attempting to ally himself with the evil trio and the final climactic battle between Superman and the evil super-villains, that takes the whole film to build up to, doesn’t disappoint – even if there is an awful lot of product placement during the battle for brands such as Coca Cola, KFC and Marlborough. The moment where the evil super-villains are in the Daily Planet office and newspapers heralding Superman’s disappearance are blown away by a returning Superman, asking General Zod if he would ‘care to step outside’ is a classic moment of cinema. One thing that has always bugged me about the Superman universe, from The Adventures of Lois and Clark, to Smallville, to Superman Returns is the way in which Clark Kent is portrayed. Dean Caine once stated that he hated the way that Christopher Reeve portrayed Clark as a bumbling fool. Therefore, he played Clarke and Superman in exactly the same way. This theme of blandness was carried through by Tom Welling and Brandon Routh, both of whom insisted that Clark Kent was a suave character exactly the same as Superman. It’s for this reason that it’s Christopher Reeve’s performance as Clark, not as Superman, that he should be best remembered for. 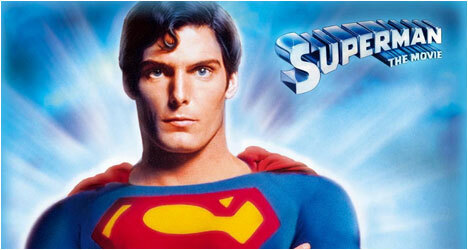 Reeve was an excellent Clark Kent, with comic timing and slapstick ability in spades. One of the standout moments for me, besides the opening of Superman III with the battery operated toys, was the subtlety with which Reeve changed his stance in Superman II when he revealed himself to Lois as being Superman. His gawky, slightly hunched stance that was Kent was replaced by the upright, boy-scout styled stance of Superman. It’s subtleties like these that other actors to the role seem to have completely missed, making Christopher Reeve the definitive Kent and Superman. While we’re on the subject of the leads, something which grated on me about the first, and to a lesser extent the second, Superman movies is the character of Lois Lane. She is supposed to be this strong willed, forthright woman who knows what she wants and knows how to get it. Yet, for some reason, Margot Kidder plays Lois as a bit of screamer. Even when she’s defying the mugger in the first Superman she kicks out at his gun before turning away and screaming. Her attempts to free herself from the car as it is buried under dirt at the end of the film, and her attempts to escape the helicopter precariously perched atop the Daily Planet building both involve copious amounts of screaming for help. These are not the actions of a strong willed woman, and certainly differ from the way Kate Bosworth played Lois in Superman Returns. Superman III and Superman IV The Quest for Piece follow on from the first two (we say that because, like Terminator Salvation, Superman Returns seems to pick up where Superman II left off – ignoring the later films). Superman III, despite a few dodgy moments with some computer graphics (it’s always hard for films of this era to use computers considering how far advanced they have become in the last decade) is a thoroughly enjoyable movie. Richard Prior, one of the biggest comedians at the time and usual film cohort of Gene Wilder, is hilarious and Robert Vaughan seems to relish the role as an evil businessman intent on taking over the world. The scene where Clark battles Superman in the junkyard is compelling, and has one of those spine tingling moments than run rampant through the first two movies. Superman IV however is a tragic let down. The film seems to use the same footage over and over again (over Superman flying towards the camera) merely changing the blue screen background, and it’s full of plot holes. We can accept that Superman can breathe in space, fair enough, but Lacy Warfield (Mariel Hemingway)? The shot of Superman holding Lacy while in space is even used as the image for the Blu-Ray menu, which is actually one grumble I have with the set; the menus haven’t really had any love applied to them at all, they’re very basic – which is a shame when you consider what is possible with Blu-Ray menu systems. Finally we have Superman Returns. This film received a fair bit of criticism when it was released, but unfairly in my opinion. The decision to keep the original intro sequence was inspired, and using footage of Marlon Brando was genius. Brandon Routh was no Reeve, for sure, but Kevin Spacey was a more than capable replacement for Gene Hackman and the effects were first class. The ‘return’ sequence of Superman saving the place from crashing into the baseball stadium, holding it up while stood on the pitcher’s mound, was iconic and, as I’ve mentioned earlier in this review, I thought Kate Bosworth did a much better job as Lois than Margot Kidder. To be honest, no matter what special features were included, what the menus were like or even what the packaging was like, this set would be worth it solely for Superman II – for my money the best superhero movie to date (though Batman Begins runs it close! ).